They started small time, robbing small villages and sacking missionary compounds. Once they crossed the line, there was no going back. They were called "The Pygmy Brothers From Different Mothers." Ha! The Different mothers part cracks me up! What a couple of bad-asses. Cool idea man! I didn't know there were pygmy goats, too. The great thing about this duo is one can be the other's getaway vehicle. -The way it's drawn, the harpoon and shotgun could actually be one two-sided weapon joined at the stock. 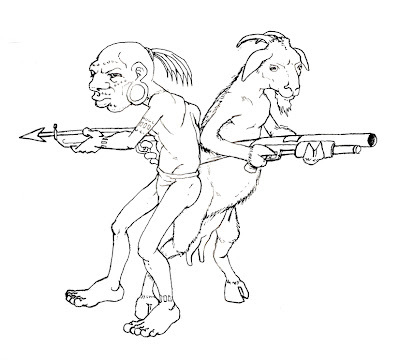 -Assuming they're not joined at the hip, but just friends, imagine a scene where two goons are coming at the goat from either side, so the pygmie tosses him the two-sided shotgun/harpoon. The goat catches it and pulls both triggers, blowing away the goons on both sides at once. -The pygmie uses the harpoon/shotgun to annihilate a horde of goons in a warehouse by shooting the harpoon into the ceiling and swinging over the crowd, firing the shotgun end downward. -And their names? Wait for it....Hall & Goats. More awful brainstorming to come!